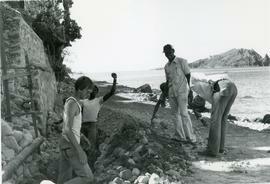 This is a photo of Leonard Shirk, left, MCC worker in Dominica, helping to dig a trench for a water pipeline along with men of Scotts Head, Dominica. 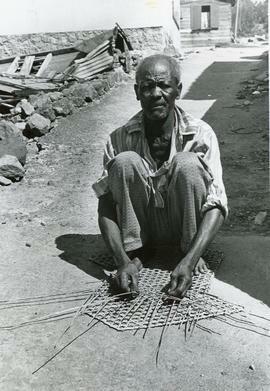 This is a photo of Dominican Felix Jervion making a bamboo fish trap. 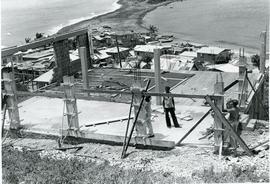 This is a photo of a pre-school under construction, an MCC-assisted project in Dominica which erected the structure and later completed its roof. Workers are producing blocks to fill in the walls with an MCC-purchased block machine. 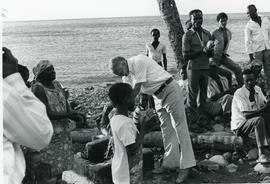 This is a photo of Jim Penner, centre, with residents of Scotts Head, Dominica. He has become their friend and co-worker.